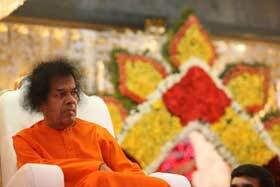 The first three days of January were a witness to an outpouring of Love from Swami towards all the alumni of Sai University who had gathered to celebrate the start of a New Year with Him. 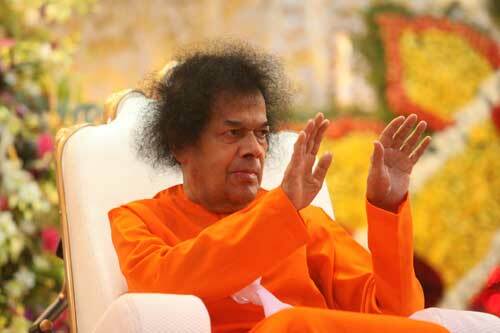 The Prema Bandham or the bond of Love as it is translated, has been a beautiful experience for one and all. On January 3 it was a real bonus. 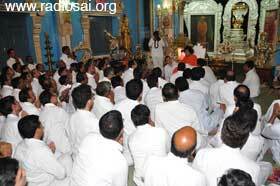 Swami had permitted all those alumni who had not yet left for their hometowns to gather in the Bhajan Hall. It was with leaping hearts and springing steps that the remaining alumni gathered in the Bhajan Hall waiting for Him. Swami also seemed to be sharing the same enthusiasm as He emerged at 5:55 p.m.! 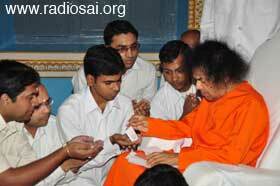 Swami completed a full round and after alighting in the portico, entered the Bhajan Hall. Once again, as He entered the hall, Swami had a big smile on His face. Oh! This unique bond between Swami and His students is so special. How much ever one tries, one cannot fathom it. Swami spoke to a few of them in the front and they offered to Him a few tokens of their gratitude - just like the squirrels that helped Lord Rama in building the bridge to Lanka by carrying grains of sand on their backs. 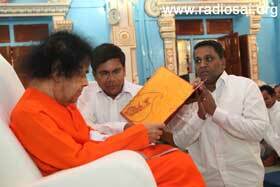 And like Rama, Swami too decided to stroke them lovingly! Taking vibhuti packets from the basket, He moved into the lines of students. As He collected their letters, spoke to them and gave padanamaskar, He also tossed to each a vibhuti packet which they gleefully accepted. If He seemed to ‘forget’ somebody, they would very eagerly stretch out for the precious packet and Swami would toss one with a smile. 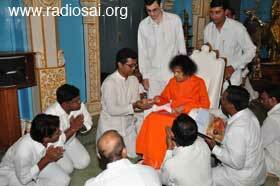 But to those that did not stretch out on being missed, Swami had a special blessing waiting. 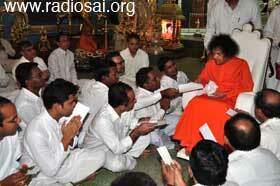 Swami made an extra round in the end and in course of that, He filled in the gaps and gave the packets to all those whom He had ‘missed’ out! This brought extra joy naturally to them for they had been remembered specially by God. 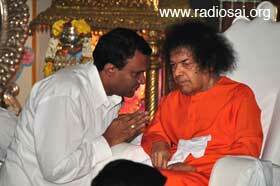 Swami spoke to almost everyone who wanted to ask Him something or tell Him something. He spent half an hour inside the Bhajan Hall and everyone inside was simply thrilled to say the least. Swami then emerged out and on to the stage. 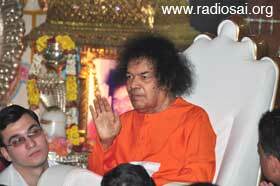 It was about 6:40 p.m.
Swami sat out for bhajans for about 15 minutes after which He asked for aarti. By 7 p.m., Swami retired to Yajur Mandir and it was curtains on yet another love soaked evening. But the stories would have surely continued late into the night for those who had that memorable half an hour with Him inside!